There are different sponsors for every day of the event - today, we're showing off our best Lawn Fawn tags. I created an interactive tag by using the biggest Lift The Flap die and an Outside In Stitched Scalloped Rectangle Stackables die. I created a little winter scene on the flap that opens, using the seals from Sealed With A Kiss and the smallest, cutest polar bear from Beary Happy Holidays. When you follow the "open me" greeting (from Push Here) there is plenty of room to write the recipient's name, or a heartfelt holiday message. I hope you like my tag, and thanks for stopping by! I absolutely love this tag! Oh so adorable! I love this!!! Oh my goodness Elena this is adorable! You ladies are rocking this tag series! Well done. Pinned! So cute. I have the Lift the Flap die set. I’m going to give this a try. I love your how tag flips open, Elena. SO creative and fun. Thanks for sharing and for inspiring us. Cute winter scene with these critters. 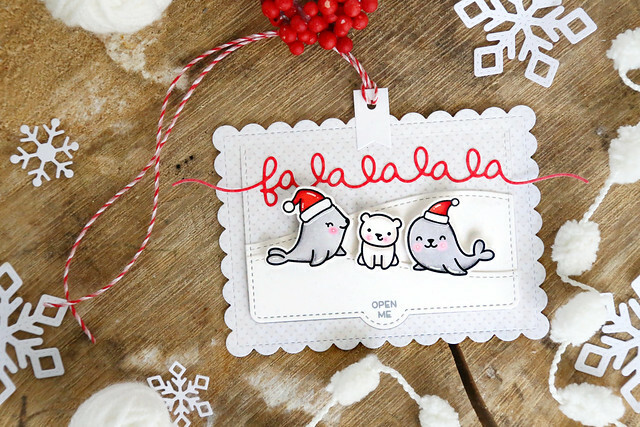 Who can resist these cute Santa seals and baby polar bear! Adorable tag! Wow, this is adorable. Cute critters, a sweet scalloped base, and the surprise element of the lift-up. Great tag! 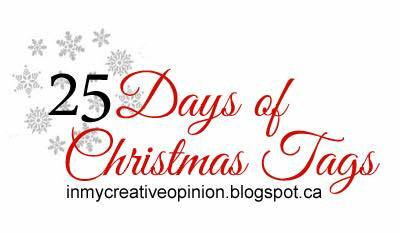 Such a delightful tag with all the small, lovely details and the super sweet seals and baby polar bear! What a clever design! Using the Lift the Flap for a tag and putting a sentiment inside - I love it! (adding that die to my looong Lawn Fawn wishlist, LOL!) I love the seals too, probably because my Mother's name is pronounced 'Seal' - I like how the fancy tails of the 'fa la la' sentiment die cut extend past the tag itself too, simply lovely! Thank you for the adorable inspiration! That's a brilliant tag ! Congratulations ! Clever tag - love the critters. Oh, another adorable tag! You do cute so well! Love how the window opens. This tag is so cute! I love seeing a different way to use the Sealed with a Kiss stamp set and dies, which are adorable! 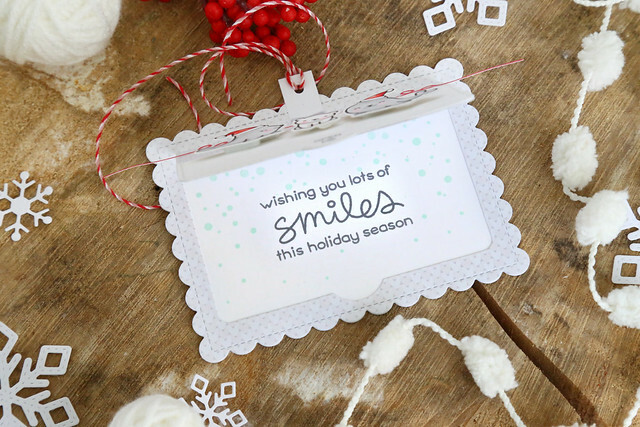 The red accents look great with the white and gray colors of the gift card holding tag! Love your sweet tag! The red and white looks so cheerful! I love how this adorable tag opens up! Very sweet!